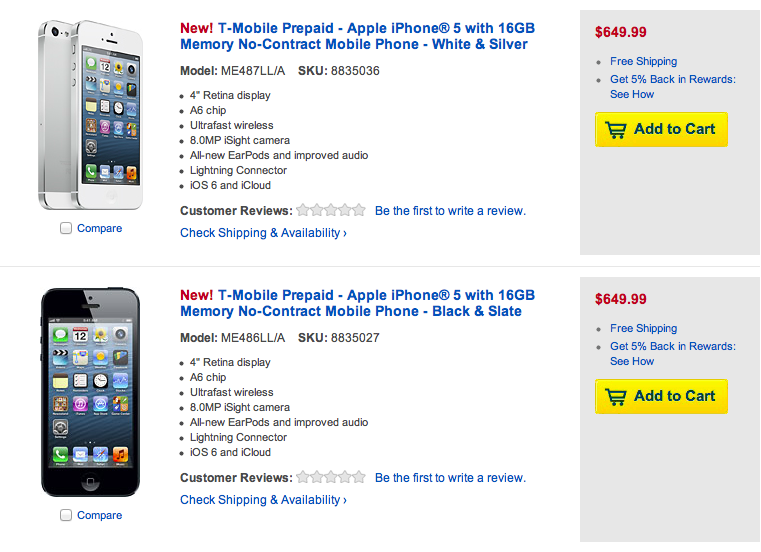 With the news that Walmart has begun carrying the iPhone 5 on T-Mobile for prepaid customers, it should come as little surprise that Best Buy has also put the smartphone up for sale. Ultimately, Walmart remains the better deal at $629 against Best Buy’s $649 price tag. So much be being the “Best Buy” huh? Still, regardless of which direction you take, the offer is still similar to Apple’s own store pricing which handily makes the Walmart pricing the best deal. The below image is now being placed in Walmart stores advertising the offer which is good for any of T-Mobile’s prepaid offerings. 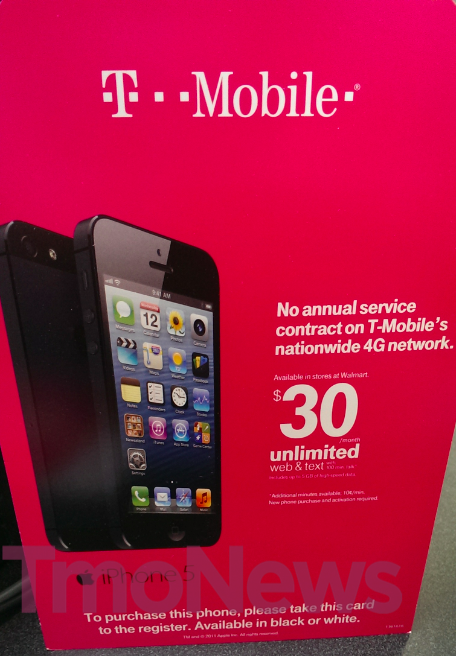 So, how does a iPhone 5 on T-Mobile’s prepaid offerings sound? Worth the price of admission? Remember that Best Buy price matches as long as it’s in stock in another store within a 25 mile radius. They do not price match phones. yes they do my friend just price matched his samsung galaxy s3 for metropcs with the metropcs website which was cheaper by a $150.00. at best buy. I can assure you that IF they price matched, it’s not because they “price match” everything. They ARE NOT supposed to price match phones. However, they are allowed to price match accessories and free add-ons for phones. They are allowed to price match phones as long ad they don’t require a contract! Is this phone locked down or carrier unlocked? I’m thinking it would be better just to go buy the unlocked version directly at an Apple store. Yup. Best to avoid Best Buy and just order directly from Apple. Also Best Buy is providing financing on it’s BB card for 18 months, mo interest. I don’t see any financing deals for Walmart. The financing deal, that Walmart had for the Straight Talk version is even no longer. i went to the Apple store yesterday to buy an iphone 5 and i asked them will the unlocked version work with hspa+ for tmobile they said no it only works with lte and reframed areas. So im asking if anyone bought the unlocked iphone 5 does it work with hspa+ or is it Edge and spotty reframed areas? it depends what version you are getting. the newer version (t-mo) does support HSPA+42 on AWS. this is incorrect. be sure you get the new model of phone with the 1700/2100Mhz support. The new unlocked Apple iPhone 5s support AWS and HSPA+. The Apple sales person didn’t know what he was talking about. what an Apple Idiot…it says on their website it supports T-Mobile AWS. If you are buying it from the apple store unlocked, it will have AWS support. Just check the serial number and box! I was reading sleswhere that the only thing that matters is that it has FH as the third and 4th position from the end of the serial number. ???? Not sure about that………….why are they raising the price when the rest of the mobile world is slashing prices on the Iphone5? 2. Go to Best Buy and have them price-match. 3. Pay for it on your Best Buy card and enjoy 0% financing for 18 months! Yes they do! The don’t price match subsidized phones that require a contract. Virgin Mobile has it for $549, another option. Good point and great price but that isnt GSM though right? funny thing virgin and boost which use sprints network is HORRIBLE with capital letters over here in los Angeles. Never ever going back there again Sprints LTE is only available in like 3 streets in east la u walk down the wrong street u on 3G which is horrible takes 5 mins to load face book, try watching vids forget it impossible load a simple webpage take more than 2 mins over here in LA sprint is rated the worse even metro pcs works better metro pcs has lte in much more places in LA amd its fast. Best Buy does not match prices on Mobile phones. Yes they do, as long as it doesn’t require a contract. I’m waiting until later this year when the 5S comes out, or whatever Apple has planned, before I do anything. I bought the 5 in December, so I’m really not in a hurry. The huge hurdle at this point is getting better coverage in my area. I refuse to be stuck on EDGE, no matter what the savings are. When T-Mobile finally decides to upgrade the largest city between Pittsburgh and Harrisburg, I’ll finally decide to make the jump. wait why dont they carry it for postpaid?